Bilston Creek in Witty's Lagoon. Spring flow. Metchosin is a land of rare beauty and a home to important ecological resources. From her rocky shores on the Juan de Fuca Strait, to her rural and agricultural lowlands threaded with streams and lakes, to her conifer-populated highlands, Metchosin is home to a vast array of plants, algae, fungi, lichens, birds, mammals, arthropods, and marine life. Increase our understanding of Metchosin’s species and ecosystems. Share natural history information with interested people in Metchosin and adjacent jurisdictions. 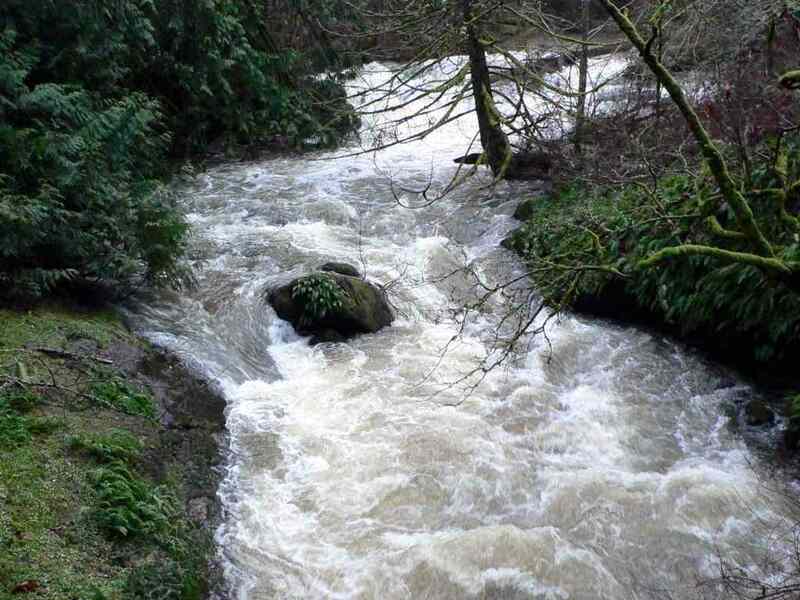 Use this information and awareness to protect and restore Metchosin’s species and ecosystems. A large number of Metchosin species have been located during the seven years of the Metchosin BioBlitzes and MycoBlitzes. Here is the summary of our counts in May of 2018, broken down by organism groups. You can view the entire set of observations--more than 10,000--by species group and by scientific name. 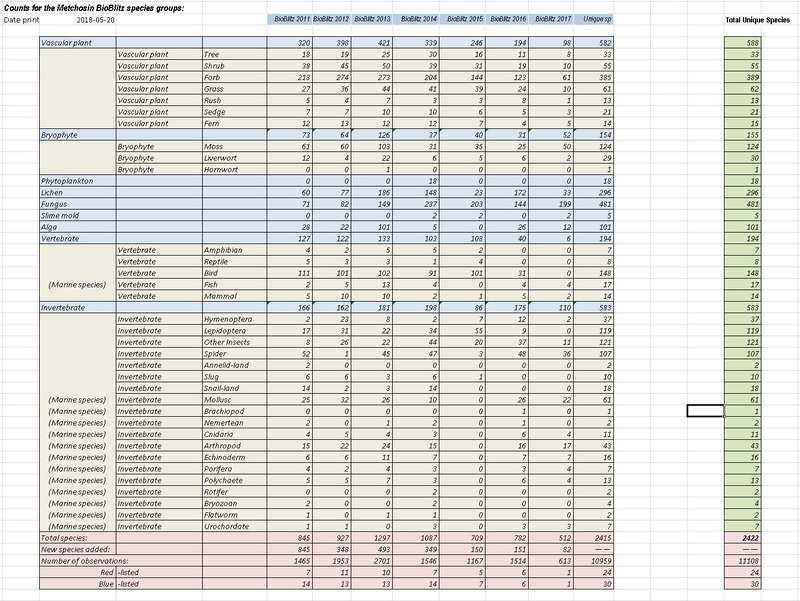 You can also download an Excel spreadsheet of all of our data (but with specific observation locations removed). These spreadsheet and observation lists were last updated in May, 2017. Species counts continued to mount during our various 2018 blitz events (described below). In November of 2018, we reached 2425 species. This last year we also began to add pre-bioblitz observations to our database. This brought the total observed species to over 2600. On May 10, Andrew Simon will be doing a presentation in Metchosin's Talk and Walk series about the Galiano bioblitzes. On the following day, Saturday, May 11, we will be having our spring bioblitz at Metchosin Wilderness Park. We will use the iNaturalist software that Andrew has been employing for the Galiano bioblitzes. Bring your smartphone and tablet and help us photograph and inventory Metchosin species. Download the iNaturalist software to your phone and/or tablet before the bioblitz and set up an iNaturalist account. Sharmin Gamiet, speaker at the 2019 MycoBlitz. The MycoBlitz will be a few days later this year than in previous years. It happens on November 8 and 9, 2019. On Friday night we will have a talk by the renowned Abbotsford mycologist Sharmin Gamiet. Sharmin, a member of the Vancouver Mycological Society, trained at UBC and the University of Washington. 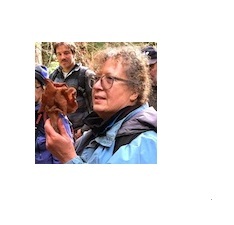 For the last 25 years she has led popular mushroom walks throughout our region.